It amazes me time and time again, how quickly the weather can change on the coast. 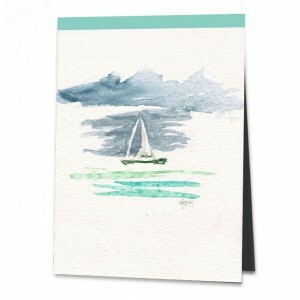 When I decided to paint the slowly gliding sailboat, the sky above me was still blue. Only over the sea was there a first dark band of clouds. Whilst unpacking the painting equipment, however, the first drops of water landed on the watercolor box and filled it with water. The brush came out from its string and the paper fell on to the paint box, with the band of clouds approaching with lightning speed. As soon as I had got the sailing boat on the drawing pad with quick brushstrokes, gusts of wind had started. Will there be a storm, I wondered doubtfully. Yes; heavy weather came. I only managed a few more brush strokes for the sky, the sea and the horizon before it began to rain. Quickly away with the pad and paint box! Before my husband Klaus and I had collected all of our things, it was already raining cats and dogs and we were soaked to the skin. What had happened to the small sailboat, I wondered, looking at the murky wall of rain. Everything is possible and maybe it is sailing once again in the sunshine.